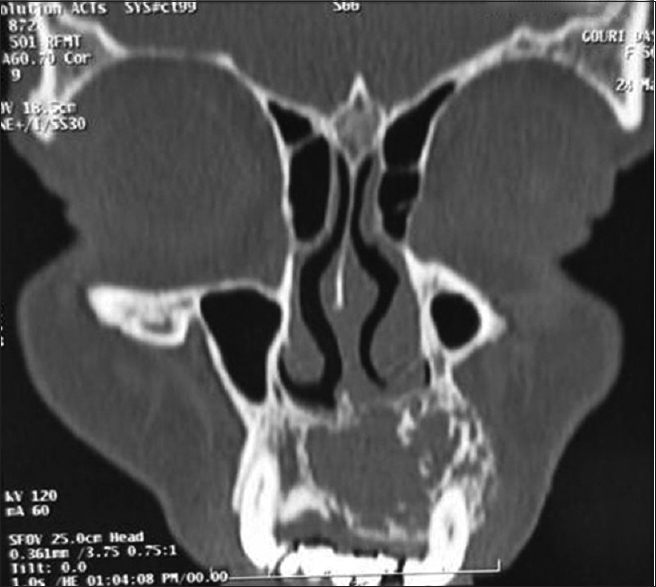 A 45-year-old female attended the outpatient department of otolaryngology for progressive swelling of the left maxillofacial area for 4 months with a complaint of left nasal obstruction for 3 months. On examination, there was swelling at the left maxillofacial area and left palatal region [Figure 1]. The mass was hard in consistency, nontender, and fixed. The skin over the mass was normal. The local temperature over the mass was normal. The rest of the head-and-neck regions were within normal limit. Computed tomography scan showed lobulated mass at the left alveolar ridge and hard palate with cortical expansile mass with little protrusion toward the nasal cavity and maxillary sinus [Figure 2]. Fine-needle aspiration cytology was done from nasofacial bulging which revealed osteoclast-like giant cells with oval nucleus. Serum calcium was normal whereas serum alkaline phosphatase was increased (290 μ/L). Surgery was planned for excision of the mass under general anesthesia. The mass was excised through the sublabial approach where the mass was extending from the hard palate to lateral wall of the nose and upper left alveolar ridge. The excised mass was sent for histopathological examination. The gross appearance of the excised mass was irregular mass of grayish appearance of 2.5 cm × 1.5 cm × 5 cm. 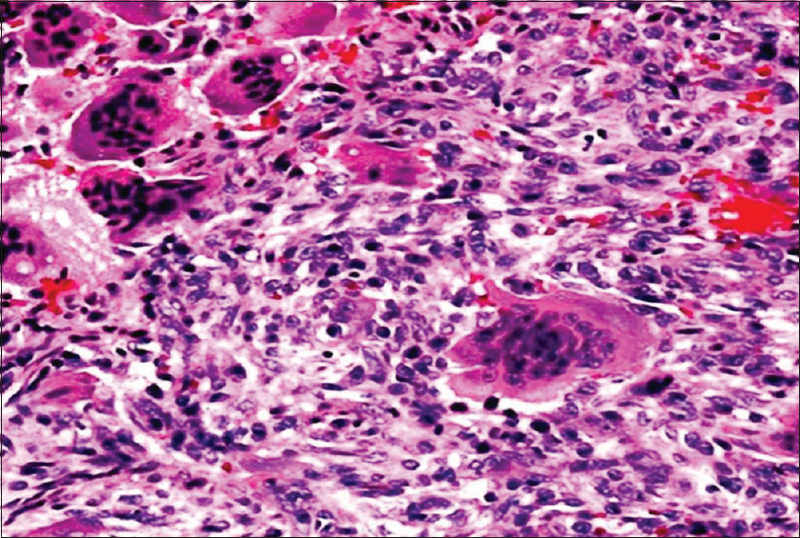 The microscopic picture of the mass revealed large multinucleated giant cells, osteoclasts, stromal cells, and inflammatory cells [Figure 3]. The histopathological examination of the excised mass confirmed the diagnosis of osteoclastoma or giant cell tumor. The postoperative period of the patient was uneventful with no evidence of recurrence during 1-year follow-up. Quadros RS, de Sousa AA, Carvalho GT, Dellaretti Filho MA. Multifocal osteoclastoma of the skull: Case report. Arq Neuropsiquiatr 2004;62:167-9. Qureshi SS, Puri A, Agarwal M, Desai S, Jambhekar N. Recurrent giant cell tumor of bone with simultaneous regional lymph node and pulmonary metastases. Skeletal Radiol 2005;34:225-8. Venkatesh MD, Vijaya N, Girish N, Galagali JR. Giant cell tumor of temporal bone: A case report. Med J Armed Forces India 2012;68:392-4. Singh HP, Kumar S, Aga P, Kumar M, Usmani SA, Agarwal SP. Huge osteoclastoma of hyoid bone: A case report. Indian J Otolaryngol Head Neck Surg 2016;68:123-5. Som PM, Brandwein M. Sinonasal cavities: Inflammatory diseases, tumors, fractures and postoperative findings. In: Som PM, Curtin HD, editors. Head and Neck Imaging. 3rd ed., Vol. 1. New York: C.V. Mosby Year Book Publishers; 1996. p. 126-318. Huang L, Xu J, Wood DJ, Zheng MH. Gene expression of osteoprotegerin ligand, osteoprotegerin, and receptor activator of NF-kappaB in giant cell tumor of bone: Possible involvement in tumor cell-induced osteoclast-like cell formation. Am J Pathol 2000;156:761-7. Wieneke JA, Gannon FH, Heffner DK, Thompson LD. Giant cell tumor of the larynx: A clinicopathologic series of eight cases and a review of the literature. Mod Pathol 2001;14:1209-15. Malwar MM. Link MP. Sarcoma of bone. In: Devita VT Jr., Hellman S, Rosenberg SA, editors. Cancer, Principles and Practice of Oncology. 5th ed. Philadelphia: Lippincott-Raven; 1992. p. 1816-52. Thomas DM, Skubitz KM. Giant cell tumour of bone. Curr Opin Oncol 2009;21:338-44. Agrawa A, Shukla A. “Osteoclastoma of maxilla” a rare case. Indian J Otolaryngol Head Neck Surg 2016;68:104-6. Iizuka T, Furukawa M, Ishii H, Kasai M, Hayashi C, Arai H, et al. Giant cell tumor of the temporal bone with direct invasion into the middle ear and skull base: A case report. Case Rep Otolaryngol 2012;2012:690148.